Add this Anthony Stoneware French Blue Ceramic Peek-A-Boo Bird House to your bird garden for an in-depth look at avian nesting activity. This charming and durable shelter is perfect for small songbirds, and its rounded shape adds an exciting look to the garden. The 5" diameter, flat back of this home affixes to a fence, wall, post, or tree with its included screw and keyhole slot. The unit tapers toward the front, and a 1.25" diameter entrance hole here enables chickadees or wrens to use the shelter. Its light blue glaze meshes with your landscaping, while its textured finish enhances the handmade appeal. Each home is fired to 2400° Fahrenheit to ensure durability and resistance to ultraviolet light, for a piece you and your birds can enjoy for many seasons. 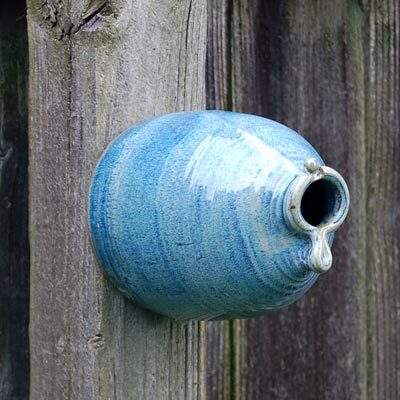 Watch bird nesting behavior in your backyard with this French Blue Ceramic Peek-A-Boo Bird House. Made in the USA.